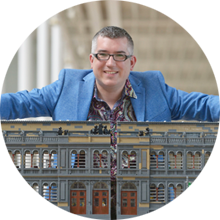 Warren Elsmore is an artist in LEGO® bricks and a lifelong fan of LEGO® who is based in Edinburgh, UK. He has been in love with the little plastic bricks since the age of four and now spends his days creating amazing models with LEGO® bricks. working full-time with LEGO® bricks, helping businesses realise their own dreams in plastic. His first book, Brick City, was released in 21 languages to critical acclaim and has been followed by a catalogue of books and commissions recreating famous places, objects and events in LEGO®. Exhibitions of Warren’s models tour museums and galleries throughout Europe, entertaining hundreds of thousands of people. His teams' commissioned work has been seen by millions more. If you're looking for something special in LEGO bricks - then look no further. We can bring your ideas into reality in simple plastic bricks. Whether you are looking for a commissioned piece or a recreation of an existing piece, LEGO bricks make a great medium in which to showcase your organisation. Our team of highly talented designers and artists can turn anything you can imaging into LEGO bricks. Using a medium that everyone can relate to easily means you can make an instant connection to your customers, employees or - well - anyone!